Many homeowners considering a kitchen remodel have a general idea of what they want – and don’t want – but they may have a difficult time conveying an image of their ideal kitchen to a designer or contractor. Not knowing where to begin, many would-be kitchen remodelers end up frustrated or disappointed. Understanding that each kitchen remodel is an investment, Cucina treats clients with the utmost care – from visiting the home to sharing design ideas in their spacious San Luis Obispo showroom – in order to ensure a pleasant kitchen remodel experience. With kitchen cabinet designs running the gamut from ultra-modern, contemporary, traditional, Tuscan and more, Cucina Kitchens and Baths takes pride in being the homeowner’s partner in creating a truly custom kitchen. The Cucina Kitchens and Baths showroom is filled with custom displays sure to spark the creativity and imagination of any homeowner considering a kitchen remodel. Solid, custom cabinetry, adorned with the finest selection of hardware, reflects the diverse styles and unique blend of quality, craftsmanship, and superior design that has established Cucina Kitchens and Baths as the premier cabinet manufacturer along the Central Coast of California. Ready to tackle your kitchen remodel project? Call Cucina today at (805) 545-8161 to find out how they can help you create the kitchen of your dreams. 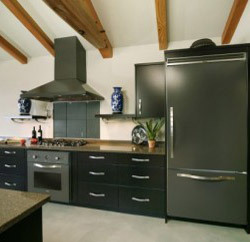 Visit the Cucina Kitchens and Bath showroom at 4420 Broad St.Suite #F1 in San Luis Obispo, CA.